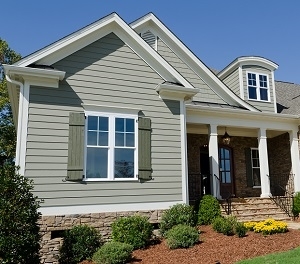 Having the privilege of being one of the select few recommended Shawnee James Hardie siding installers is a real honor. At Sure Point Exteriors it only makes sense to partner with a manufacturer of such esteem since we take such pride in the work that we do. We are only as good as the materials that we use. Being the best in exterior remodeling is something we take great pride in, but our results would still only be mediocre if we used inferior materials. Just as even the best in materials is only as good as the professional who is installing them. Superior products in the hands of shoddy workers is not going to give you the results that we want. When you pay for a quality product like James Hardie siding, ensure you have an experienced, qualified siding contractor in Shawnee to install it, like the pros here at Sure Point Exteriors. Even down to the trim that we use, only the best will do. This is why we utilize Fiber Cement Siding Trim Boards from James Hardie because even the final touches make all the difference. These pieces accentuate details like corners, windows and so much more. The quality is of the same superiority you would expect. Including the fact that this comes with ColorPlus ® Technology. This means you can expect that vibrant color to withstand the tests of time and the elements without losing its vibrancy. As a Simonton Preferred Installer, you can feel confident that we are also as serious about installation and replacement of your windows and doors in Shawnee, KS. Many homeowners do not realize what a big impact this has on your home. For one thing, this will provide you with a whole new look without the hassle and expense of remodeling or repainting your entire home. Another big benefit is that you can maximize your energy efficiency. Improved quality doors and windows will help you keep your utility costs lower. Plus, this also means your home will be more environmentally responsible. You can also feel good knowing that this will help with issues like UV rays. Harsh sunlight can get in and damage your flooring and furniture. Improved quality glass for your doors and windows help lower the risk of this happening. Let's not overlook the importance of superior quality gutters either. Why are your gutters so essential? This system is in place to catch rainwater coming off of your roof. From there the water is transported to the downspout. Water from the downspout is sent away from the foundation of your home. The reason this is important is that, without gutters, water would run directly towards the foundation. This all works in order to help preserve the structural integrity of your home. If you have gutters in Shawnee, KS that are old or in need of repair, you are putting your home at risk. For this and all of your exterior remodeling service needs, you can give us a call! Our exterior services team and experienced siding contractors in Shawnee, KS are always happy to assist our customers. "Dalton and his crew did a superb job. They worked hard everyday and finished the job in a few days. Dalton was always available by phone and accommodated every request in a timely matter. Dalton was always willing to go the extra mile, from installing new lights to picking out the right color to paint our front door. Sure Point Exteriors gets our highest recommendation." "The siding project was completed timely. The end project was simply outstanding"
If you are looking for a professional Shawnee James Hardie siding contractor, then please call 913-203-8812 or complete our online request form.